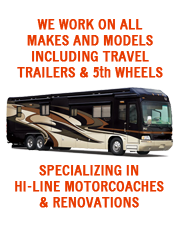 From the day an RV rolls off the assembly line and is exposed to the elements its roof sealant begins to deteriorate. Deteriorated roof seals cause leaking which can lead to major interior problems such as water damage and delamination. Damage can often occur before you are even aware of it. Inspect your RV roof for sealant cracks, deterioration, or missing sealant along roof seams at least twice a year and have it resealed by a RV repair center if you notice any of the above signs.